Yesterday, I was scooping water from our little stream to water in some transplants and caught this little critter. It brought back many memories. In Louisiana, there are hunting seasons, fishing seasons and seasons for harvesting the various indigenous shellfish: shrimp, oysters, crabs and crawfish. You may know these crustaceans as “crayfish” or “crawdads” or “mudbugs”, but I grew up calling them “crawfish”. There are several ways to crawfish (verb). 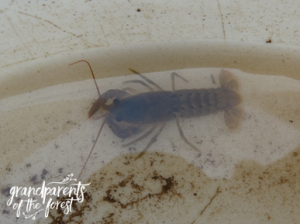 I remember going out at night with my parents and grandparents collecting crawfish as they traveled from their burrows to who knows where… maybe to visit their girlfriends. Their burrows where easy to spot: the crawfish would build a ‘chimney’ around the entrance to the hole with little balls of mud. I have seen crawfish chimneys several inches tall. Each person had a pail and a light: either a flashlight, or headlamp or white-gas lantern. We roamed around a field near a swamp searching for the crustaceans. When we found one, we would step gently on its head and pick it up by its tail. You pinned its head with your foot so it would not pinch your fingers with its big claws that it waved around in self-defense. Another memory came to me that I cannot shake. It involves another way to catch crawfish. When I was very young, maybe 4 or 5 years old, my Dad took me crawfishing across the river. That would be the west bank of the Mississippi River. You can catch crawfish in a special net or trap. The net we used was a cotton net (My paternal Grandpa could make these nets! It may be a lost art now.) suspended between two pieces of stiff wire bent to form the top four sides of a pyramid with the net being the bottom of the pyramid. The net-bottomed pyramid is placed in water about 12 to 18 inches deep so that the top of the wire pyramid is visible above the water surface. You usually tie a piece of brightly colored cloth to the top so the net is easy to spot as you ‘run your line’. I can still see the bright dark red strips of cloth identifying our traps. Now, crawfish are freshwater, bottom-dwelling scavengers. They particularly like chicken necks. So most people tie a piece of chicken neck in the center of the net to attract the critters. If you ‘fish’ from a bank you use a long pole with a hook – sometimes just a nail or screw put into the side of one end – to reach out, quietly move the end of the pole under the apex of the pyramid, quickly lift it out of the water, swing it over a tub or bucket to dump your catch. You have to do this quickly since the net has no sides and the crawfish will swim or scuttle out – backwards, as that is how they move – if you are too slow. Well, this particular crawfishing trip I remember so vividly, was to a pond – or swamp – that didn’t have a shore we could walk along. Dad had 20 or 30 traps (maybe more or less – it was a long time ago and I was little so everything is probably remembered much bigger than it really was). The two wires that held the net were attached at the apex in such a way they that they sprung apart when the net was flipped once or twice. All the traps were opened and set out like rows of ghost tents as Dad tied the bait in the center of each net. Then came the part I remember best. I climbed on my Dad’s back with my arms around his neck and my legs around his waist as he waded out into the pond and set each trap in a big circle in the water. When we got back to the start we waited. I don’t remember how long, for a child that young, it was probably interminable. Then I climbed back on Dad’s back and he walked s-l-o-w-l-y around the pond from trap to trap with a pole in one hand and a galvanized washtub floating beside us. You know: the kind of tub you fill with ice to chill watermelon on a hot summer day, or wash your dog in. He moved slowly to not scare the crawfish away from their short feast in our nets. In one smooth motion, he would reach out with the pole lift the trap, let is slide down the pole, over the tub and then tip our prey out. He would pick out the under-sized ones and toss them back… probably to be caught several more times before the day was over. This had to have been a difficult and amazing feat to perform with a small child half strangling him and in such a way as to not dump said clinging cargo into the water. You know, it’s possible I rode on Dad’s shoulders straddling his neck, but that is not the memory that sticks. We went around and around the pond, me encumbering him, until the tub was full enough for a big dinner for the whole family. Huge pots of water are brought to a boil and special Cajun seafood spices are added then the entrée are dumped in and cooked. This works for crawfish, crabs or shrimp… and we are usually talking a bushel or two of food at a time! In the meantime, the dining table is covered in several layers of newspaper. When the seafood is done cooking – not more than a very few minutes – it is extracted from the pot and dumped into the middle of the table in a huge pile. Shells and other inedible parts are placed onto separate dishes or special metal platters. When the last crawfish is consumed or peeled and set aside – because it is seldom the case that it is all eaten – to go into a later gumbo or jambalaya, the whole multilayer newspaper table covering is folded and rolled into one big bundle and put in the trash. You don’t have to carry your child into the swamps to strongly imprint lasting memories of the outdoors. There are plenty of other adventures awaiting for you and them. What wonderful memories can you create with your child? Nature enthusiasts Harry LeBlanc and Deb Vail are at home in the forest hiking to reach beautiful vistas and searching for native plants in the southern Appalachians. 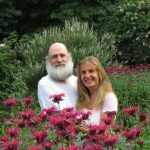 They are co-founders of Grandparents of the Forest, an intimate business offering simple yet meaningful ways for children and their parents to connect to Nature for well-being and healing. They also make Sacred Forest® Flower Essences from the plants they encounter. They are former organic farmers and parents of 5 grown children. We took advantage of a perfectly beautiful day to walk up our mountain to check on the progress of Spring. One mission of our walk was to find the first wildflower of the season. We didn’t find it… yet. But… There are lots of tiny little plants peaking out through the leaf litter of the forest floor. We did find two other evidences of Spring. Right! We saw some frogs swimming and jumping in the pond. They hid from us under the leaves and mud, so we could not identify them. (You would hide, too, if you saw something 100 times bigger than you coming towards your home!) But they left a huge mass of something that tells us they are there even if we had not seen them jump and swim. Can you tell what is in the picture? Of course! 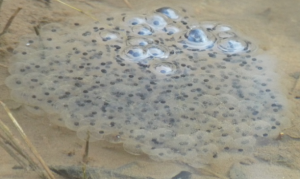 Frog eggs! You can see the big embryo in each transparent egg. In a short time, we should be able to see a tiny tadpole wiggling in each egg. This pond will be FULL of tadpoles soon! If we had sat down and been very still and quiet, I bet the frogs would have come up and sang for us. 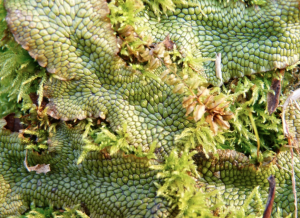 This plant that looks like lizard skin is a ‘liverwort’ (a bryophyte). It is a ‘lower plant’, more primitive than ferns and mosses (some of which you can see poking out between the thallus (not a leaf or stem, but a ‘body’) of the liverwort. This plant has no stem, leaves, flowers, seeds or ‘veins’. Instead of seeds it has spores. This primitive liverwort should not be confused with the spring wildflower liverwort (Hepatica), which will bloom in about a month. We found one more thing near this liverwort and moss. I’m not positive, but I’m pretty sure they are little insect cocoons. 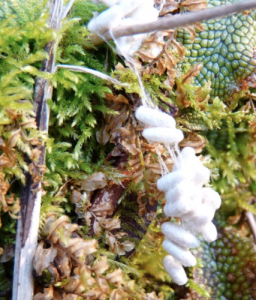 They could be insect eggs, but I don’t think so. IN either case, they have been here all winter waiting for warm weather to arrive so they can emerge. Even though it may still be cool where you live, go out and see what ‘signs of spring’ you can find.